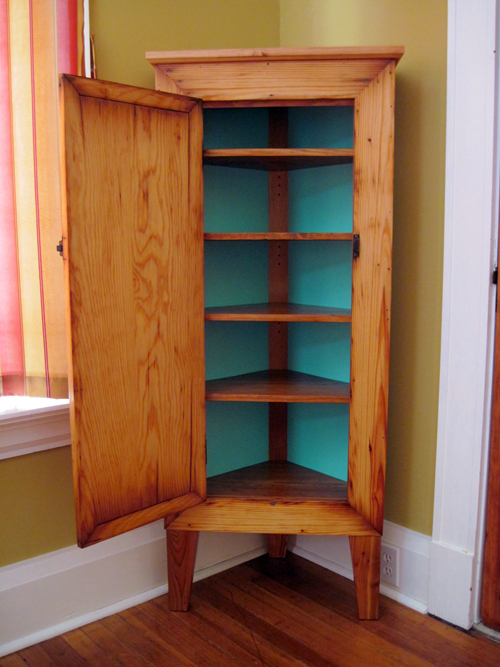 I built this corner cabinet as a Christmas present for Christine. It is made entirely of reclaimed wood, but is particularly special to us because the door and face frame are made from our home’s original electrical panel box. I’ve been holding onto it for 12 years, thinking about the most appropriate use for the large door. I settled on the corner cabinet as a way to maximize space in our bedroom, which is dominated by large windows. The latch and hinges are the original hardware, but I inverted the door in order to have the latch at a better height. By extending the sides of the cabinet straight back from the face, I gained better shelf space and allowed the door to clear the window ledge when it swings open. The color on the interior of the cabinet panels was suggested by some reclaimed plywood shelving, and I mixed a new batch of paint to clean it up. Both sides of the back panels are painted. I made a children’s table with a similar color scheme last summer, which you can see here. I just like the way the aqua blue/green colors look next to the wood. The cabinet has four adjustable shelves, and the rear pin can be dropped about four inches in order to allow the shelves to angle down, creating a "bin". This makes them handy for socks and small items. 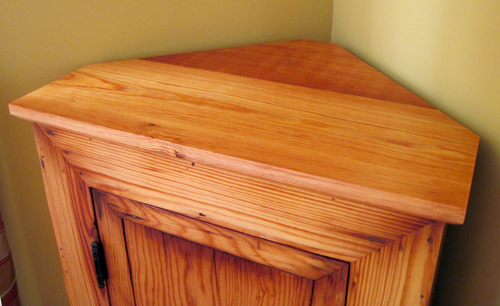 The cabinet top is made out of two pieces of short-leaf pine. 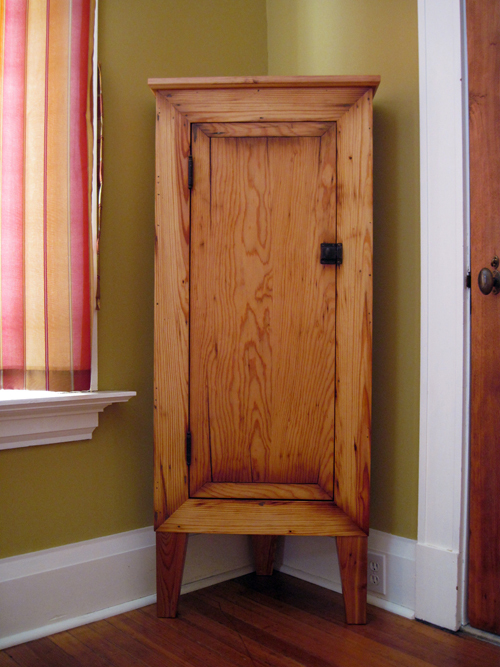 This entry was posted in custom furniture, Uncategorized and tagged cabinet, electrical panel, original hardware, pine, reclaimed, repurposed, short leaf piine on January 3, 2013 by johnsarra.